Brief Synopsis – A businessman and his wife must deal with raising a dozen children while keeping all of their lives still normal. My Take on it – I’m actually surprised that I never had the chance to see this film before despite being such a fan of a similarly fashioned film Yours, Mine and Ours (1968). The story is quite entertaining in the way that it deals with the difficulties of raising a large family while still trying to show us the unique eccentricities of the members of the family. They do a great job of touching upon certain social issues usually avoided in films at the time and give a wholesome perspective on them. The fact that this is based on a true story helps make it even more engaging and enjoyable to watch since we know that lots of what is presented really happened. 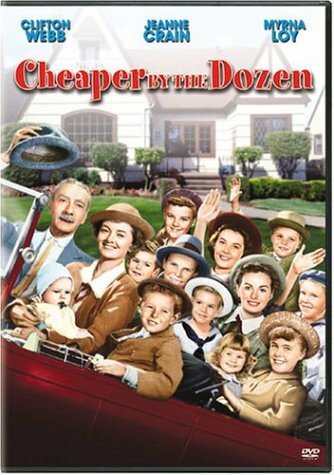 Clifton Webb and Myrna Loy are both great here as the parents and their chemistry with one another and with the dozen kids says so much about the realistic feeling of it all. Loved the way that they showed how they deal with decision making within the large family. The only problem that I had with this film is its length which was much too short at slightly under 90 minutes. It would have been great if we were able to get to known more of the kids and their own storylines instead of just the oldest. Regardless, this was a real enjoyable film to watch. I’ll now have to rewatch the remake with Steve Martin and Bonnie Hunt to see how that stand up against this film. Bottom Line – Very entertaining story that deals with the difficulties of raising a large family yet also shows the eccentric ways that this family was raised. They touch upon certain social issues of the time showing that they aren’t ignoring it at all and do so in an tactful way. Knowing that this film is based on the story of a true family makes it even more enjoyable to watch. Webb and Loy are both great here. The only problem here is that the runtime is too short and it would have been nicer to become more familiar with more of the kids and their issues. Recommended!